You have a vivid imagination that you can use to imagine new possibilities for your life. All you have to do is DARE to imagine what you want. You use the power of your imagination every day. In fact, you have created many things in your life because you have used your imagination to do it. They say that to imagine is to be a Magician. This implies that you can do and be anything if you can imagine it! The problem is that most people’s powers of imagination are sorely lacking. We only imagine through the limited images we are given by the media. Do you realize we are bombarded by images every day through the TV, magazines and billboards? There is so little room for our own imagination. We are shown what to buy, what to wear and how to be. We have very few original images to create our own unique life. The Australian Aborigines have something to teach us about the powers of imagination. Let’s look at the figure above, which is part of Megan’s 9th sacred robe for Imagination. 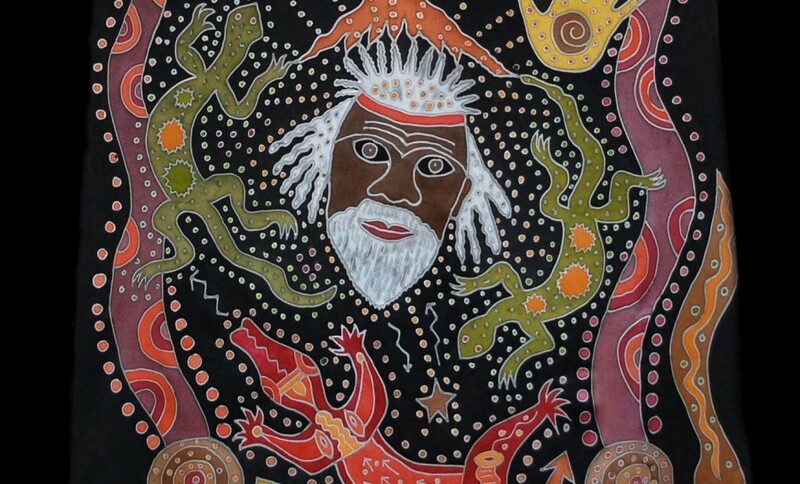 The Australian Aborigines have a direct line to Dreamtime through the use of their imagination. They access symbols from the unconscious, messages from dreams and from other dimensions of reality. They show us the many possibilities open to us – if we would only imagine it!